For the original release, see Grandia II. Updated version of Grandia II featuring improved textures, lighting and shadows, the original Japanese voice option and an additional difficulty level. Audio files are poor quality with a lower average bitrate compared to previous versions of the game. See HQ Music Mod for a fix. Backup the entire /Sound or Sound_n folder somewhere. You don't have to, if you need to revert the entire thing, you can just re-verify the files. Refer to the ReadME or download page for additional instructions for noted optional files. Make a backup of your <path-to-game>\data\afs folder. This mod will overwrite many files in there and you should keep a backup to make it possible to undo everything. Use Grandia II 3D Vision fix. Enabled by default. Can be reduced or improved through the graphics card control panel. Frame rate is capped at 30 FPS. Battles can be run in 60 FPS. 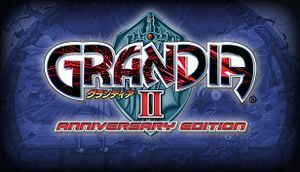 See Helix Mod: Grandia II Anniversary Edition. ↑ 2.0 2.1 File/folder structure within this directory reflects the path(s) listed for Windows and/or Steam game data (use Wine regedit to access Windows registry paths). Games with Steam Cloud support may store data in ~/.steam/steam/userdata/<user-id>/330390/ in addition to or instead of this directory. The app ID (330390) may differ in some cases. Treat backslashes as forward slashes. See the glossary page for details. This page was last edited on 2 March 2019, at 10:29.